New Delhi, Feb 22: From average tax-payers and rail commuters to global investors and analysts, all eyes for the next seven days are on two crucial Indian budgets to be tabled by the ministers overseeing the finance and railways portfolios. 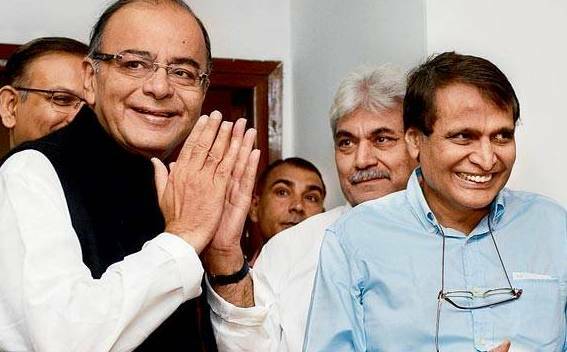 While Railway Minister Suresh Prabhu presents his budget on February 25 amid a growing gap between the money India’s railroad network makes and spends, Finance Minister Arun Jaitley has this task four days later in sending the right cues on reforms and in the national budget. In the interim, Jaitley will also table in the Lok Sabha, the lower house of parliament, the Economic Survey for 2014-15, authored by Chief Economic Advisor Arvind Subramanian, which will seek to give an overview of the current state of the Indian economy and the required policy actions. In a recent post on YouTube, Minister of State for Finance Jayant Sinha said the uplift of the poor, progress of farmers and employment for the youth will be the focus of the upcoming budget. “This budget will be a forward-looking budget that will ensure that India will continue to be a haven of stability and growth in a very turbulent and choppy global environment,” he said. Earlier, Finance Minister Arun Jaitley had spoken about facilitating tax payers. In presenting its expectations of the budget, the Indian industry has highlighted the importance of clarity in tax laws and other significant implementations needed to boost trade and economy. “The proposal to reduce corporate tax rates announced as part of last year’s budget is undoubtedly a step in the right direction. However, there are several other factors that warrant a closer look,” Federation of Indian Chambers of Commerce and Industry (Ficci) said in its pre-budget memorandum. “There is a need to ensure stability in tax policy in the medium term. For instance, in an income-tax context, this involves eliminating frequent policy reversals, both directly (for example through the removal of MAT exemption to SEZ units) as well as indirectly,” it said. In this regard, the government has said tax exemptions are costing India’s exchequer about Rs.200,000 crore annually and it is necessary to phase them out to provide a level playing field for domestic companies to make for a successful Make in India. “In direct tax, we are losing about Rs.1 lakh crore in these exemptions. The cause may be noble, but it distorts the taxation system. In case of indirect tax also, we are almost losing Rs.1 lakh crore because of various exemptions given for SEZs, EOUs,” Revenue Secretary Hasmukh Adhia said last week on the ministry’s YouTube channel. The Indian economy grew 7.3 percent in the third quarter ended December 31, 2015 — down from the 7.7 percent expansion in the previous quarter, but marginally up over the 7.1 percent over the like period of last fiscal, official data showed last week.